Shark Defenders: How Many Sharks Around Guam? During Tuesday's public hearing on Guam, there was disagreement on the health of the shark population in the waters around Guam. Western Pacific Regional Fisheries Management Council representative Manny Duenas testified that there was anecdotal evidence of more sharks, while scientists from the University of Guam presented scientific data that the numbers were low. CONTRARY to statements made by local fishermen about the abundance of sharks around Guam, local scientists state they have scientific research that proves Guam’s shark population is, in fact, in jeopardy. During Tuesday’s public hearing on Bill 44-31, which seeks to ban the possession, sale, trade and distribution of shark fins and imposes heavy fines and imprisonment if caught, local fishermen testified against the bill because they believe there is no need for it. Fishermen’s Cooperative Association of Guam President Manny Duenas said federal law already addresses the issue. 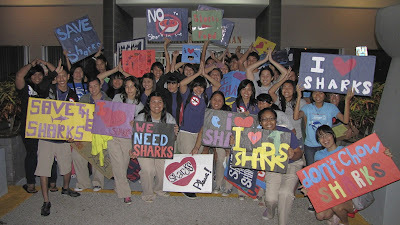 Furthermore, he stated that sharks are abundant in Guam’s waters compared to the 1970s and 1980s and not disappearing. Duenas also wanted to clarify that local fishermen are not the “bad guys” as the bill seems to portray. He stated that most fishermen fish for subsistence purposes and do not profit from fishing. One fisherman, John Aguon, stated that the bill does not clearly separate commercial and subsistence fishing of shark. Aguon said although he consumes shark carcass meat, he does not want to be portrayed as a “shark killer” because sharks feed him and his family. However, local scientists state otherwise with data to prove that the local shark population could be in danger of disappearing. University of Guam Associate Professor of Fisheries Dr. Jenny McIlwain, in her testimony during Tuesday’s hearing, said she had astounding footage of sharks around Guam and in Galvez Bank, 15 miles south of Guam. A study, which was funded by the National Oceanic and Atmospheric Association Coral Reef Initiative and a joint venture between UOG and the University of Western Australia, was conducted over a 12-month period. In the study, baited remote underwater video stations, or BRUVS, were deployed at 75 different sites around Guam’s waters at depths of between 30 to 100 feet. Only 10 sharks were counted in total, most of which were black tip reef sharks and two gray reef sharks. This, McIlwain said, equates to about 0.13 sharks per hour of footage. In Galvez Bank, 22 sharks were counted, which was equivalent to 0.8 sharks per hour—seven times more sharks than in Guam. McIlwain said that compared to studies in Australia also using the BRUVS method, wherein some areas were known for being fished for shark fins, Guam still had about four times less sharks. “I think these data speak for themselves,” McIlwain said. The bill should be amended to include a monitoring program through the Division of Aquatic and Wildlife Resources, McIlwain said, to determine, over the next 10 years, if a ban is effective in restoring Guam’s shark population. Stefanie Brendl of WildAid, in her written testimony, said it is imperative for Guam to join in a Pacific-wide legislation. Because Hawaii became the first jurisdiction to enact a shark fin ban, activities such as foreign trading would likely shift to other areas in the Pacific. Also, contrary to statements made by local fishermen about the bill’s conflict with federal law, U.S. Assistant Attorney Karon Johnson said there is no conflict. “To the contrary, the Guam law fills in the gaps. Federal law only applies if the fins have been moved in interstate or foreign commerce,” said Johnson.